Finding a green carpet cleaning company in Langhorne, PA will mean finding a company that uses 100% green cleaning agents in their carpet cleaning process. At OxiGreen in Langhorne, PA, we believe you will find what you are looking for…and more! Here at OxiGreen in Langhorne, PA we use only 100% green, biodegradable cleaning agents. They are eco-friendly, safe for the environment and your family. We never use any harsh chemicals, which could threaten the health of your family of damage the fibers of your carpets. Our cleaning agents are made from the tea tree, which has been proven to have a number of healthy uses. We pair our 100% green cleaners with our state of the art, truck-mounted carpet cleaning equipment for a thorough, deep cleaning. Our process shoots water deep into the carpeting, disrupting the dirt, mold spores, bacteria, dust mites and other potential allergy-causing substances. Our professional extraction process removes this debris right along with about 98% of the water. This makes for not only a deep clean, but a fast drying one as well. Most carpets we clean will dry in two hours or less, many in as little as a single hour! There won’t be a major disruption of your daily schedule with an OxiGreen carpet cleaning. 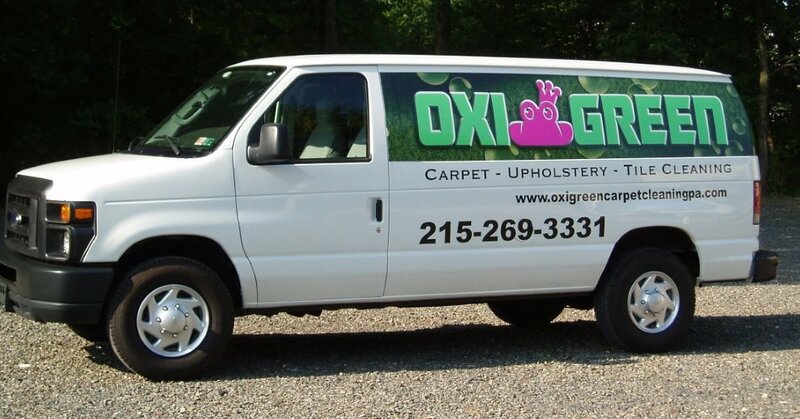 Why not call OxiGreen in Langhorne, PA today and schedule a free in-home carpet inspection? We have helpful staff on hand at 215-269-3331 to answer any questions you might have, and to let you know about our packages deals and the other services we provide, including expert carpet repair, carpet stretching, upholstery cleaning and tile and grout cleaning. If you have allergy sufferers in your home, be sure to ask about our special allergy relief cleaning package. We are here to serve you. Call today.